Steven Spielberg’s E.T. : The Extra Terrestrial, now following Jaws in a pristine (though less revelatory) deluxe Blu-ray edition, draws on the director’s memories as a child of divorce, when he created an imaginary friend to keep him company. Spielberg and his screenwriter, Melissa Mathison, have channeled those memories into a open-hearted piece of storybook science fiction, but the fundamentals of E.T.—the reason why everyone talks about it making them cry—have nothing to do with the marvels of outer space and interstellar connection, or even the touching vulnerability of the creature itself, as it struggles to survive on an uninhabitable planet. The core theme of E.T. is home, and the journey of the film, taken in literal synchronicity by the young hero and his alien friend, is about them helping each other find it. It’s a common story told on a celestial scale. Beyond anything alien-related, E.T. makes its first and perhaps most indelible impression as a portrait of life in suburban California, where 10-year-old Elliott (Henry Thomas) resides as the middle sibling in a broken home. Spielberg never shows any town center, just an endless—though appealing—sprawl of homes carved into hills near a redwood forest, all new and still growing. (The big bike-chase sequence cuts through the frames and foundation of more houses under development.) Point being, there’s no history to this place, just a lot of families like Elliott’s that are trying to build or reconstitute their lives from scratch. There’s the promise of a better life, but for a mother and three children grappling with a father’s abandonment, that life is still very much a work in progress. From there, E.T. unfolds in a series of simple, sweet, funny scenes of Elliott and his siblings getting to know the alien and harboring him from their mother while government operatives snoop around the area. They also set about the bittersweet task of helping their new friend get back home via a communication device assembled from a Speak & Spell toy, a tinfoil-covered umbrella, and a coffee can—like a treehouse phone across the galaxy. As they wait for pickup, E.T.’s health starts to fail just as the government scientists—shot as faceless and imposing, at the midsection and through silhouettes—close in on Elliott’s house and quarantine the place to examine the ailing visitor and its hosts. Giving Elliott and E.T. the extra-sensory connection of feeling what the other one feels is the most powerful device in the film, and the most evocative of Spielberg and his imaginary friend; after all, what is an imaginary friend but an extension of the person doing the imagining? Spielberg plays it to comic effect in a famous—and perhaps a little too cute—sequence where the alien raids a beer-stocked fridge and an inexplicably drunk Elliott liberates the frogs marked for dissection in his science class. But the emotional payoffs are overwhelming, especially once the connection between the boy and his new friend falls away, making their teary goodbyes seem like the severing of an umbilical cord. Their parting could be the end of a vivid dream where Elliott wakes up at home, surrounded by family, like Dorothy in The Wizard Of Oz. 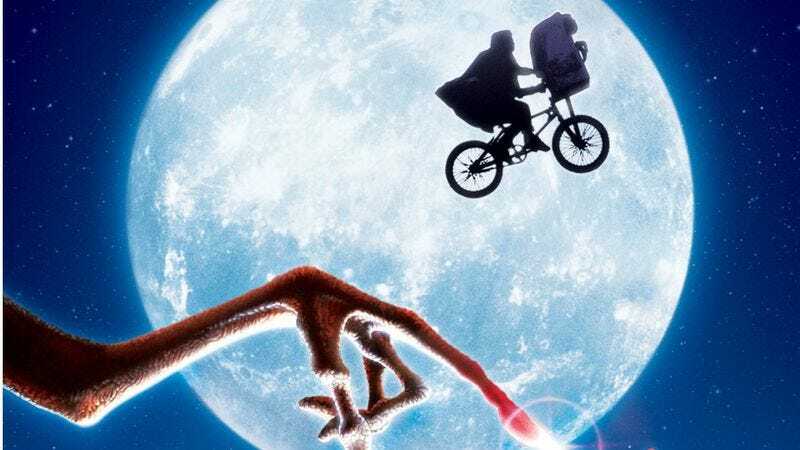 The childlike openness of E.T. isn’t far removed from the shameless arm-twisting of Bad Spielberg, but the combination of the director’s perceptive work with young characters and actors, John Williams’ exalting score, and the fairytale grandeur of the images keeps the film soaring above the sticky bogs of sentimentality. The shot of Elliott’s backyard framed in the half-moon light ranks among Spielberg’s most indelible images—and is the most beautiful in the film full stop—trumped only by the iconic sequence that sends the boy and his friend biking into what became the Amblin logo. The best thing about E.T. is that it would work just as well as a silent movie (with Williams’ orchestral accompaniment, of course), one that taps into the elemental desire for family and home, which is something a child shares with the child in all of us. Key features: Unlike the recent Jaws special edition, which made a well-earned fuss about a new transfer and an array of new features, many of the elements in the new Blu-ray are ported over from the previous edition, including deleted scenes, a few featurettes, a piece about the music, and some photographs and marketing materials. The only new features have Spielberg reflecting on the film and its legacy, and “The E.T. Journals,” which unearths footage of the production.